The ErtelAlsop Horizontal filter housing provides all the benefits of traditional vertical filter housings with several added bonuses. The horizontal orientation allows for single person operation, and eliminates the need for overhead hoists. The unique ErtelAlsop “Lock and Load” System allows easy loading and unloading of Pak filter cartridges with the assistance of Teflon guides. The housing can be provided as a single unit or as a dual, tri or quad system on a baseplate, complete with common piping. In addition, the horizontal design can be provided in various materials of construction and to ASME code. The enclosed design and horizontal orientation make this unit cost effective for most applications. It provides minimal product loss along with reduced labor requirements. 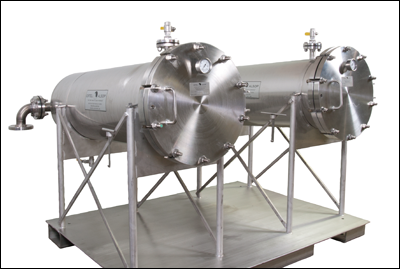 ErtelAlsop’s Horizontal Pak filter housing is the perfect technology to replace old leaky plate and frame filters in liquid processes. All ErtelAlsop lenticular Pak filter cartridges are suitable for use in the horizontal housing.